Like the triumph of Brexit in the UK, the election of Donald Trump was an angry verdict on decades of rising inequality and a version of globalization that benefits those at the top but leaves ordinary people feeling disempowered. Mainstream parties are unlikely to win back popular support unless they learn from the populist protest that has displaced them—not by replicating its xenophobia and strident nationalism, but by taking seriously the legitimate grievances with which these ugly sentiments are entangled. These grievances are not only economic but also moral and cultural; they are not only about wages and jobs but also about social esteem. Michael Sandel is Anne T. and Robert M. Bass Professor of Government at Harvard University, where he teaches political philosophy. His writings—on justice, ethics, democracy, and markets—have been translated into 28 languages. 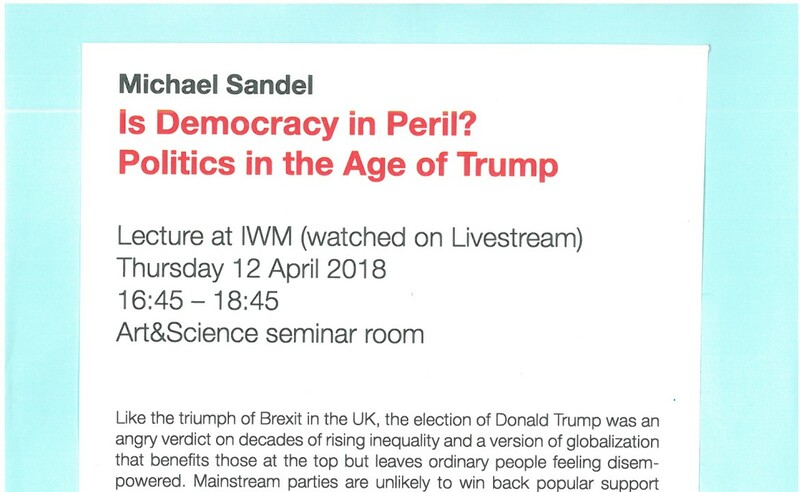 An IWM Non-Resident Permanent Fellow, Sandel is a member of the American Academy of Arts and Sciences, has been a visiting professor at the Sorbonne, and delivered the Tanner Lectures on Human Values at Oxford. His global lectures have taken him across five continents and packed such venues as St. Paul’s Cathedral (London), the Sydney Opera House (Australia), and an outdoor stadium in Seoul (S. Korea), where 14,000 people came to hear him speak. Sandel’s books, four of which are available in German, include 'What Money Can’t Buy: The Moral Limits of Markets' (Was man für Geld nicht kaufen kann); 'Justice: What’s the Right Thing to Do? '(Gerechtigkeit); 'The Case against Perfection: Ethics in the Age of Genetic Engineering' (Plädoyer gegen die Perfektion); and 'Public Philosophy: Essays on Morality in Politics' (Moral und Politik).